Samuel Athey, Benjamin Athey, Alfred Busick, LeRoy Busick, John Busick, Amos Brown, James Baird, Elizabeth Leadford, N.S. Simmons, L.F. Wisdom, Giles Williams, Geo. Babcoke, Delaney Bowlin, Isaac Boyce, Joseph Babcoke, M.L. Cranfield, Nancy Conner, B.F. Cotten, Qyincy A. Myers, L.F. Simmons, J.D. Wadley, E. Whitaker, G.W. Holder, Rachel Jones, Louisa Jesse, C.K. Jennings, James Jesse, Geo. Jesse, J.W. Jones, Asariah Jones, Wm. Jones, John K. Jones, J.S. Jones, Mary Manis, S.C. McCasland, Joseph Cox, Louis Conner, Thos. Conner, Martin Conner, Daniel Conner, Adaline Cotton, Pleasant Conner, J.C. Simmons, M.D. Vaughan, N.P. Williams, T.G. McClure, M. McConnel, J. Potter, J. Salling, R.B. Snider, John Snider, J.H. Simmons, M. Stout, H.B. Cox, Sarah Conner, Wm. L. Downing, W.H. Downing, James Duncan, T.M. Dale, Josiah Elliott, J.B. White, J. Watt, and Elizabeth Walters. Although the Rocky Mount post office was moved to Morgan County more than half a century ago and road signs today on Rte. Y mark the community in that county, many "oldtimers" still think of Rocky Mount as the country village that once stood in western Miller County. Here clustered around the site where the Rocky Mount Baptist Church sill stands, was old Rocky Mount. It figured prominently in the early day history of the area, lying along a wagon road that led from Tuscumbia on north to Boonville, and to the northeast to Jefferson City. Travelers from Jefferson City to Tuscumbia first came by way of Rocky Mount, following the old Harmony Mission Trace, the first trail across Miller County after the Indians, north of Rocky Mount. They then turned south through Rocky Mount to Tuscumbia. Clyde Lee Jenkins, in his history of the county, points out that Alfred M. Houston followed this route from Rocky Mount to Tuscumbia when he was commissioner of the Miller County seat of Justice. In the beginning he made the trip by ox team, requiring 18 hours to reach Tuscumbia. Later, with a good team of horses, the county seat could be reached before noon. 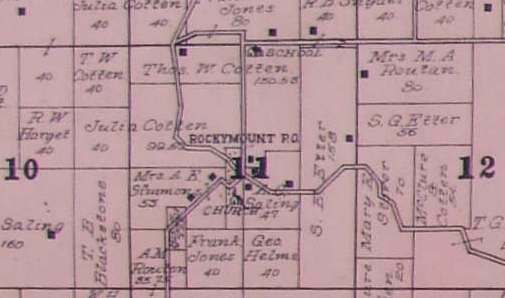 Rocky Mount had other claims to fame in the early day history of the county. It was near here, on the A.G. Wilkes farm, that the Rev. J.M. Houston is believed to have held the first school in the county-a subscription school-in the 1830's. By November 1870, Rocky Mount had become a country village with a general store, two blacksmith shops, a drugstore, a post office in the store and several homes. Its post office was one of the first four post offices to be established in Miller County. Among the merchants of these early years, were John H. Simmons and a man named Daniels; Frank Stover and Lem Wisdom were blacksmiths; a man named Cordry had a drugstore, and later sold to Jim Jobe. At least one doctor practiced medicine there-Dr. Elliott. Rocky Mount had been included in a site entered by a man by the name of Solomon in the late 1840's and its growth began. In 1889 its population was estimated at 50, and at the turn of the century it was known as a coal mining area. At least one room of the big two-story white house that still stands near the Rocky Mount Baptist Church is believed to be one of the original houses in Rocky Mount. 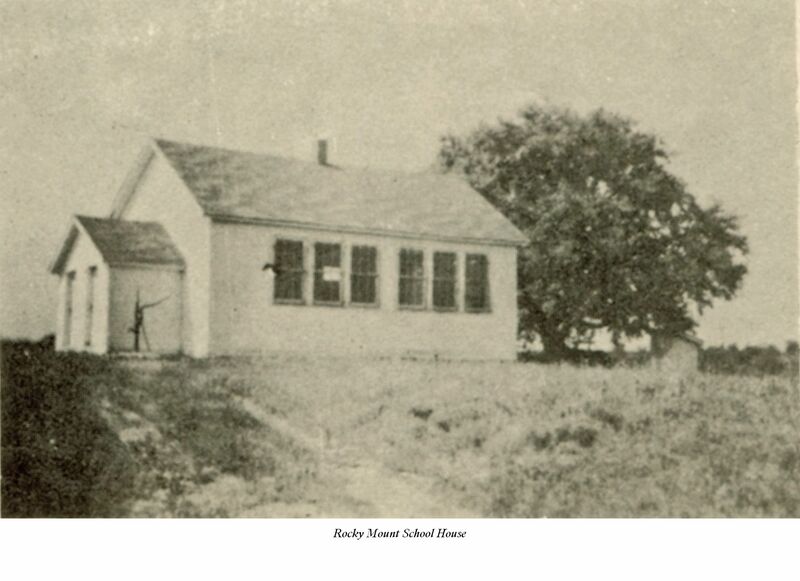 The village also had its school, but only the Rocky Mount Baptist Church still is active after more than a century at "old Rocky Mount" in Miller County.